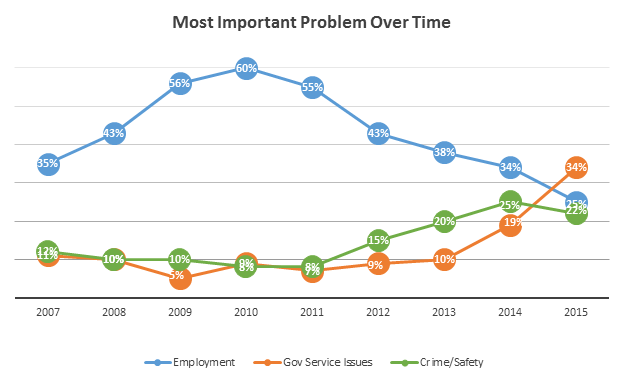 Akron, OH- The 2015 Stark Poll, conducted by the Center for Marketing and Opinion Research, found that Stark County residents think the most important problems facing the county are government service issues, issues around employment and crime and safety concerns. For years, government service issues such as road conditions only concerned between one-sixth and one-tenth of Stark County residents. In 2015, that number nearly doubled with more than one-third of residents, 34%, citing these issues as the most important issue facing the county. After holding the most important problem spot for the last 8 years, employment concerns such as not enough jobs and high unemployment were considerably less troubling in 2015 than just last year and significantly less than its most troubling point when in 2010, more than half of Stark County residents, 60%, found employments issues to be the most important issue facing Stark County. While crime and safety issues, such as too much crime and drug and alcohol issues, are the third most troubling to Stark County residents, the number that find it most troubling are down from 2014. Times are changing.